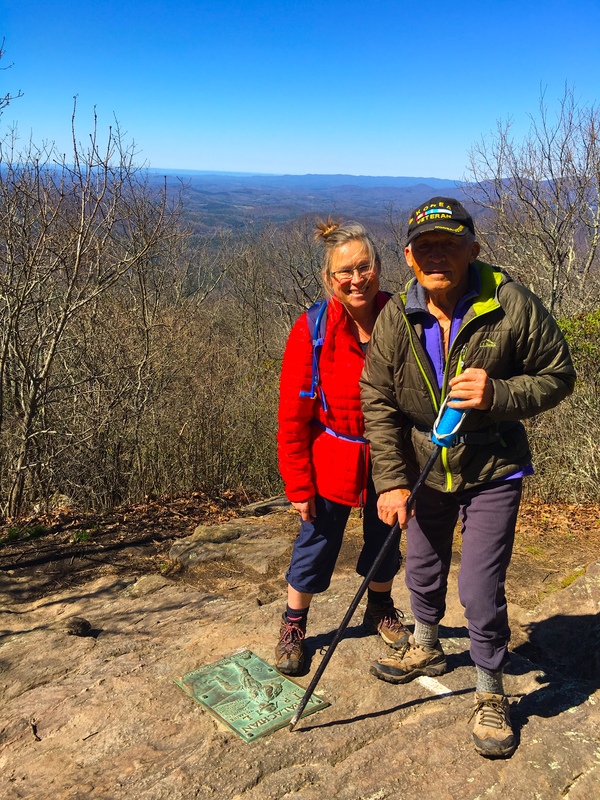 On March 3, 2018, Victor “Pappy” Kubilius set out from Springer Mountain, GA, for a hike that is set to go into the AT record books. 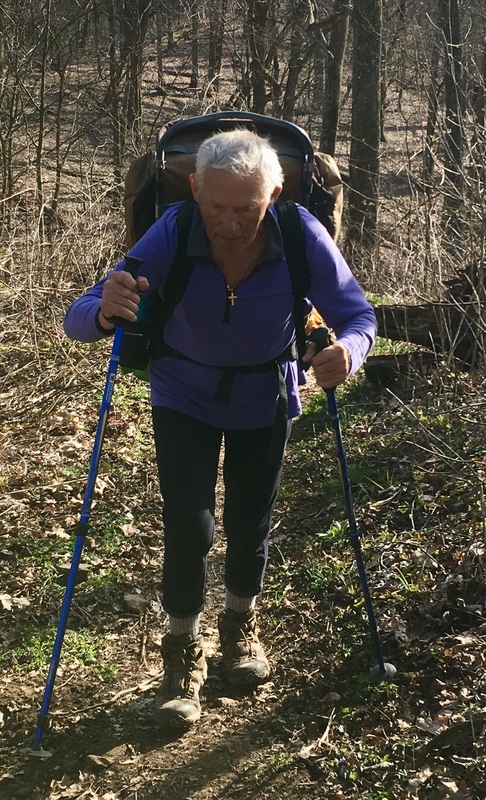 If he finishes, it will make him the oldest person who’s ever thru hiked the Appalachian Trail. Because of his advanced age, he may likely retain this title for quite some time…..if not forever. 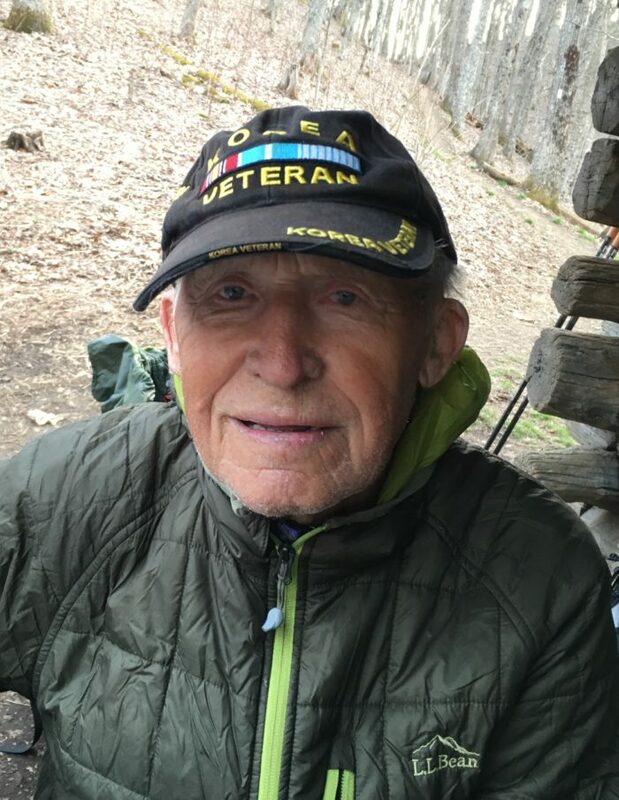 Several weeks ago, the word went out on social media that there was this 87-year-old man—a Triple Crowner—somewhere out on the AT attempting to hike it again. Jimmy , a YouTube vlogger had the good fortune to interview Pappy early on in his hike, putting him out there for all to see. How wonderful, I thought, would it be to to meet up with this unique gentleman and get his story, for it must be incredible. I put out the word at Standing Bear Hostel to call me when he arrived. And then I waited. It didn’t take long before I got the call that a tired and worn-out Pappy had trudged up the road to Standing Bear, after a horrible bout of severely cold, snowy conditions in the Smokies. I was heartbroken when I was called to work and unable to meet him. I vowed to get out on the trail on my earliest opportunity and see if I could find him. The following week, when Pappy should have been long out of the area, I went to Hurricane Gap on the TN/NC border after work on a sunny but chilly day to take some drinks and food up to Spring Mountain Shelter. I parked my truck beside the trail and no sooner had I rounded the back of the tailgate, I saw the weather-worn face of an older man emerging from the trail. “Hello, what is your trail name? “I called out. “Pappy,” he answered in a coarse but soft voice, with a hint of a foreign accent. I was flabbergasted. The man whom I thought had moved on was delivered right to me; as if it were meant to be—and I believe it was! Raising my hands to the heavens, I shouted, “Oh Pappy, I’ve been looking for you!” He must have been taken aback by this crazed man (me), arms flailing, because he stiffened and stood straight up, which immediately shifted the center of gravity on his external frame backpack, sending him staggering unsteadily backwards down the slope he’d just come up. I dashed over and grabbed his arm to steady him, pulling him back uphill. 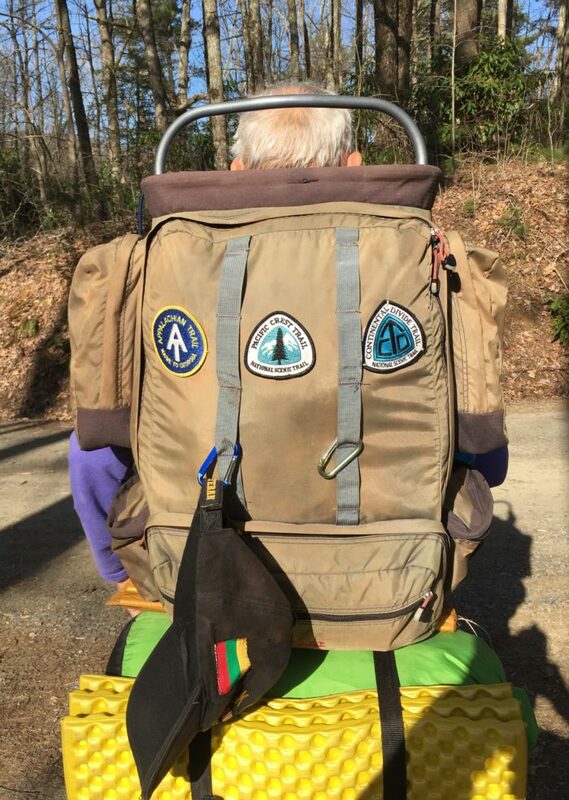 He shook my hand off and said, “I’m okay, I don’t need any help.” Thoroughly chagrined, I realized I was treating him more like a decrepit senior, than a man who’d just hiked almost 300 miles while wearing a 30-pound pack. His surprise turned to acceptance as I explained the odd coincidence of us converging upon the same point at the same time. With his shirt bathed in sweat from the long 10 miles he’d already done since leaving Hot Springs at 10:30, I offered him an ice cold Coke. After a short meet and greet, we began walking up the trail together. For next mile and a half that I walked with Pappy, I learned that he was a widower who got his trail name from his grandkids. I listened as he shared his amazing life story, from his tumultuous childhood in Lithuania to his current thru-hike. Watching this seasoned man making his way up the gentle grade, I realized that whom I was seeing was not just an extremely fit, 87 year old setting a record, I was seeing a man, unlike many convalescing people his age, who has already done more in his long lifetime than most people ever dream of–and he’s not through yet. There was so much I wanted to know, I hardly knew where to begin. So, I began with the beginning. He said he was born in Lithuania in 1931. Lithuania is located between two powerful nations, Germany and Russia, so they were easily crossed by invading armies at war. He grew up in a hazardous time when great armies annexed his country—first Russia, then Germany, then the Soviet Union. He told me that they were hard years and his family was forced to move often. In 1947 he emigrated to the US, where he told me he “worked during the day, and took English classes at night.” In 1952, he was drafted into the Korean War. What many might regard as a bad period worked out pretty well for Pappy. During that time, he became a US citizen. Plus, since he spoke four languages—Lithuanian, Russian, German, and English—he didn’t have to fight on the front lines. He was instead used as a linguist. 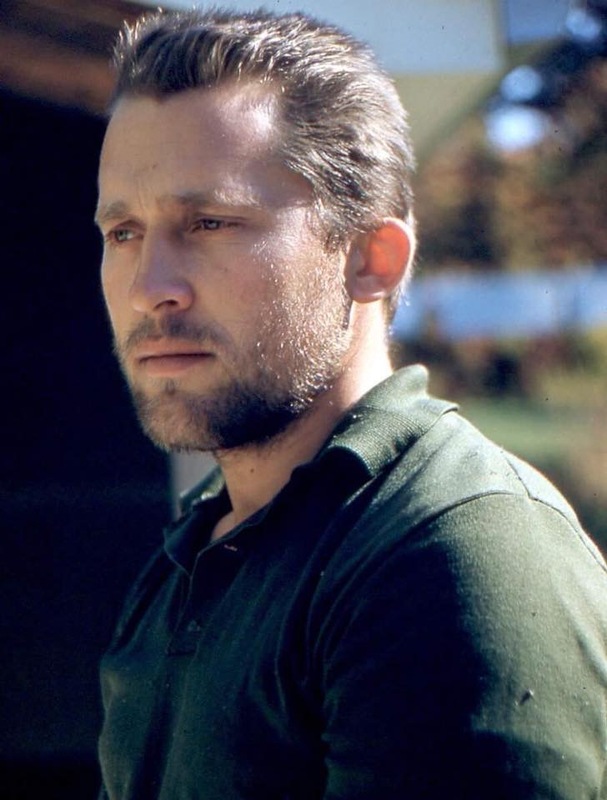 Not only was his wartime experience beneficial in the sense that it helped him become a US citizen, Pappy was also able to use the GI Bill to take electrical engineering classes, which launched him into a lucrative career in electronics, working 35 years at United Technologies in East Hartford, CT.
“Why electronics?” I asked. He smiled and began relaying a story from his youth when he first heard a man’s voice emerge from a radio. “I was fascinated with radio as a kid; amazed at how people could fit into a box.” Ever since, he wanted to know all he could about the kind of technology that would enable you to hear someone’s voice from many miles away. Marching on with dogged determination, he made his way up the gentle grades leading to Spring Mountain Shelter. Walking along the trail with Pappy was comforting. His breathing echoing throughout the quiet forest reminded me that the air whooshing through his reliable, healthy lungs had been doing so for a long, long time. His eyes lit up as he came within sight of the shelter, with tents scattered about the open spaces of the clearing. Undoubtedly he was ready to unload his 30-pound pack after the long 11-mile slog. When I asked if he used a tent or hammock, he said, “I only sleep in a tent if it’s raining; otherwise I sleep on the ground.” He was grateful to find that there was one more spot open in the shelter, and wasted no time in setting up his mat and sleeping bag in the narrow space between other hiker’s bags. While Pappy was getting situated, I broke out the tub of cottage cheese I’d packed and began plating it up, topping it with lovely fresh strawberries and passing it around to the numerous hikers who’d been gathering around the campfire. Pappy finally sat down at the picnic table, proudly wearing his Korean War Vet hat, and I served him a plate of berries on cottage cheese. He made short work of this and asked for another plate. Then he did something uncharacteristic: he asked for one of the beers I brought. While sipping away with a relaxed look coming over his face, he told me, “I haven’t drank anything for a long time”. He later confided, “I’ve never been drunk in my entire life”. It was gratifying to see someone get a little relief from the rigors of the trail. Now that he was relaxing and loosening up, I proceeded to ask questions about his life and health. -2,650-mile PCT in 1998, age 67. -3,100 mile CDT in 2002, age 71. Q) Have you ever smoked cigarettes? A) No, not ever, although I took a few puffs of one when I was sixteen. It made me so dizzy and sick to my stomach that I never wanted to do it again. Q) Do you regularly take any medicine? A) No, but I do take a small Bayer low-dose aspirin every day as my doctor has recommended. Q) Have you ever had any heart problems? A) No, no, and no. However, Pappy did mention that he’s been having a little pain off and on in his right foot but he thinks that it will go away when he gets to Damascus, where he’s going to buy a better pair of shoes. Astonishing as it seems that an 87-year-old could have so few problems, Pappy’s life is a testament to two major things: good heredity and a healthy lifestyle. Like any hiker, the rigors of frigid weather through the Smokies had left him feeling the effects of prolonged cold and exertion, but the weather is turning and spring is on the way. During my brief walk with Pappy, when I asked him why he’s hiking the AT again, “Are you trying to do it to get recognition or fame”? In almost a word-for-word rendition of Jack Lalanne’s reason for his efforts, he answered, “No, I just want to see if I can still do it.” His enthusiasm on this hike hasn’t diminished. He hikes every day with a sense of awe and wonderment at the beautiful country he loves so much. Like Pappy, Vikki is a remarkable woman in her own right. 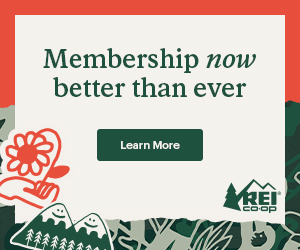 Having grown up in an all-boy household, and spending much of her time with a robust, outdoorsy father, she readily took to being in the great outdoors, gaining a love for it that has lasted all of her life. Vikki is 55, currently lives in Chaplin, Connecticut, and works as a farrier, a physically demanding and dangerous job. Being raised by such a rugged man, she has the physical and mental toughness to successfully compete in such a male-dominated profession. But her love for the the outdoors is what attracted her to this field, as it allows her to spend even more time outside. Growing up, Vikki found her father to be a firm but fair man who instilled good character in his children. He was a good provider for his family, not only working at his primary job in electronics, but running a TV repair shop on the side for many of those years. Despite this, he always managed to find time to hike and keep himself physically fit. There was one other thing Vikki shared that Pappy didn’t tell me: he has had a pacemaker installed in his chest. She explained that because of his extremely fit cardiovascular condition, his heart beats slower, at the pace of an athlete. When he sleeps, his doctor was concerned that his heart rate might drop too low, thus the pacemaker was installed as a precaution. “Yet,” she said, “It is is hard for him to accept the limitations of his age.” Even though he can outdo just about everybody his age (and probably many half his age), he wishes he could move along as fast as he did the first time he thru-hiked but has come to accept the limitations that come with being nearly 90 years old. Vikki told me that the cold, snowy weather through the Smokies was physically challenging, taking a lot out of him. Yet, despite the misery the trail has thrown at him thus far, he has rebounded and is making his way toward Virginia, well past the point of our brief interlude. His immediate plans are to join up with last year’s record breaking oldest AT hiker, 82-year-old Greybeard, in Damascus in the coming weeks. What an interesting meeting that will be! What a wonderful article. Wish there was some way I could follow his hike. What a inspiring man. 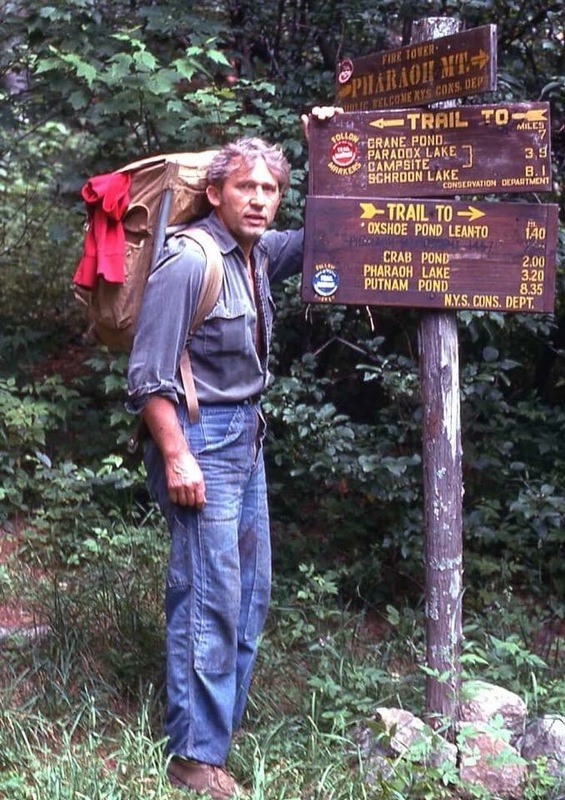 Hiked for some southern miles in ’96 with Pappy. He’s the real deal. We have kept in touch since. Hope to help him up here in northern New England when he’s up here. He has biked much more than this article, including from schroon Lake NY to Alaska…and back, with a side trip along the Dempsey River to the Arctic Ocean in Canada. This guy is a book and a movie yet to be produced. Is there a blog or somewhere I can follow his progress. What an inspiration! Hope the trail is kind and rewarding to Pappy! A strong and stubborn Lithuanian! Great article, Bloodhound. I’m 77 and still hiking having held the AT record for oldest female thru hike for three years. I agree wth Pappy that the secret to a long and healthy life is to keep moving. I’m rooting for his success. Keep up the enjoyable articles. Love Maria and Standing Bear. Thank you, Bloodhound, for this story. Probably the best and most complete story I’ve read regarding those who have hiked or are hiking the AT. That was a really well done story! I’d love to see more like this. Just when I was feeling old ((65) and sick of waiting for my injury to heal, you go and spoil my self-pity party with this great article about an exceptional man. Thank you for writing this. I needed this kick in the behind to remind me that I’m not done yet. I have Pappy, Jack Lalanne and Granny Gatewood (a fellow Ohioan) as excellent role models. I am planning on thru hiking the AT one day. I am glad to see that it’s possible at an advanced age because that’s probably the only time I’ll be able to do it myself. Thanks for such a great article. Pappy is my grandfather. Follow me on Instagram (below) if you would like updates. Will be posting weekly updates starting this week for the inspired!!! 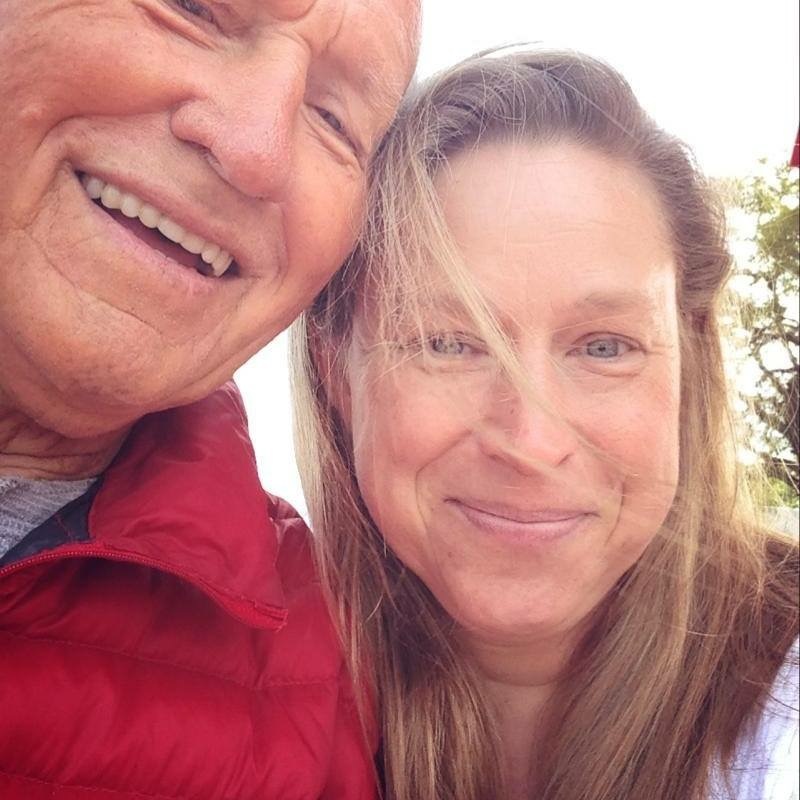 The oldest hiker meets it’s youngest (this year), see this insta post: https://www.instagram.com/p/Bljgb1uFSsW/?utm_source=ig_share_sheet&igshid=o0rx72h2wye5 how inspiring!!! 87 years of WISDOM. I’d like to pick Pappy’s brain one day. On Friday, June 1st – June 2nd we had the privilege of meeting with, talking to and hiking with Pappy. I was hiking with my two oldest sons, my father-in-law and his other son-in-law when we came across Pappy nearing Petite’s Gap & later my Father-in-law, Rick Cooper, helped Pappy put his Poncho on as it began to pour the rain. Later we saw him again at the Marble Springs Campsite. While eating our dinner I had the chance to talk with him about his life – his many hiking treks & where he was from. Later the next day we came across him at Matt’s Creek Shelter where he gladly took a comfortable rest. My two boys talked with him and asked how he was feeling. Before heading our way out – he mentioned he would need to resupply seeing he was out of food – we had the privilege of giving some of our food to this amazing Man. May God bless and help this man continue to the end and in good health. We sure were glad to meet him! Please anyone keep posting any updates. I”m routing for Pappy and hope he makes it before I get time to hit the trail.